Hickory, NC- Hit a homerun this Valentine's Day with the Crawdads Valentine's Day Package! The Crawdads are now accepting reservations to make this Valentine's Day one to remember. The package comes with a rose from Whitfield's Flowers & More, a choice of a Crawdads or Crawmoms tee shirt, and a NC Pediatric Dentistry Family 4-Pack (4 undated tickets, 4 hot dogs, 4 fries, and 4 soft drinks) all for only $59! 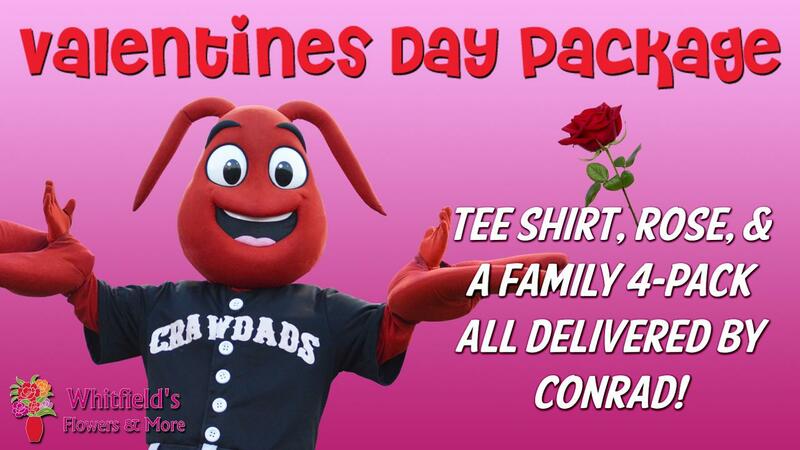 The Crawdads Valentine's Day Packages can be delivered to your special someone by Conrad himself. Deliveries are on a first come, first serve basis so secure your Valentine's Day surprise by ordering now. All orders must be placed by February 13th and deliveries must be within 25 miles of LP Frans Stadium. To order your Valentine's Day Package or for more information, call the Crawdads front office at (828) 322-3000. The Crawdads will open their season at L.P. Frans Stadium on April 11th against the Kannapolis Intimidators. For more information about the Crawdads, including promotions, ticket books, and group outings please visit www.hickorycrawdads.com or contact the front office at (828) 322-3000.